The global roofing underlying materials market demonstrates a highly fragmented competitive landscape, states a new research report by Transparency Market Research (TMR). 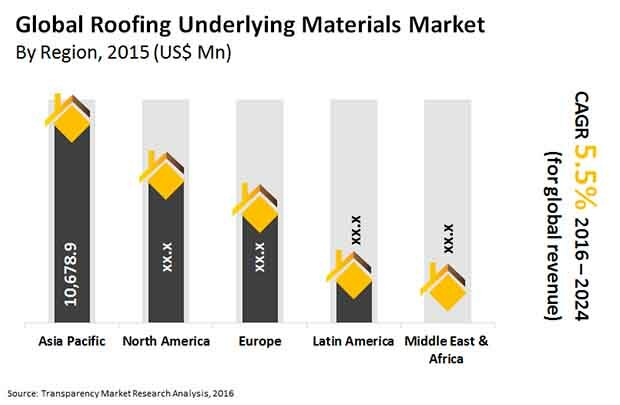 In 2015, the top five vendors of roofing underlying materials across the world could hold only a meagre share of 13.5% in the overall market. The market also shows a highly competitive structure and with constant entry of new players, this competition is anticipated intensify in the near future. Some of the leading players in this market, mentioned in this report are Owens Corning, IKO Industries Ltd., DuPont, Firestone Building Products Co., Carlisle, TAMKO Building Products Inc., Braas Monier Building Group Services S.A., and CertainTeed Corp. According to the research report, the opportunity in the global market for underlying roofing materials was US$27.99 bn in 2015. Expanding at a CAGR of 5.50% during the period from 2016 to 2024, the market is anticipated to rise to US$45.16 bn by the end of the period of the forecast. Currently, non-bitumen synthetic materials are the most valued product in this market and is expected to remain so over the next few years. In terms of the application, the non-residential segment has acquired the lead and is projected to continue on the top in the years to come. Geographically, Asia Pacific has been dominating the global market, thanks to the rapidly developing construction sector in this region. With the significantly increasing number of homeowners, the Asia Pacific market for roofing underlying materials is likely to retain its dominance throughout the forecast period, states the market study. “The significant rise in the residential construction projects, especially in developing economies, such as Costa Rica, India, Indonesia, China, and Malaysia, propelled by the rapid urbanization, economic strengthening, has fueled the need for a wide array of roofing materials over the last few years, reflecting greatly on the global roofing underlying materials market,” says an analyst at TMR. The market is further expected to gain substantially from the current rise in construction activities in the commercial sector, particularly in the developed nations, reports the research study. Although the worldwide market for roofing underlying materials will be witnessing tremendous growth in the near future, its growth trajectory may be slowed down with the lesser number of new construction projects. However, the rise in refurbishing and maintenance activities will support this market in gaining traction in the years to come, states the research report. Non-bitumen synthetic materials are the most valued product in this market.